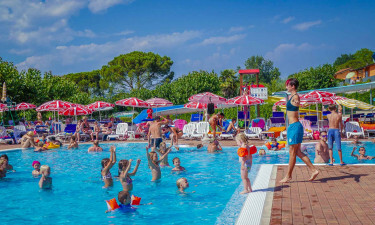 A family-friendly campsite, ideally situated along the southern shore of the beautiful Lake Garda. A luxury campsite filled with activities for children, including a mini-club for tinies and variety shows for all the family to enjoy in the evening. 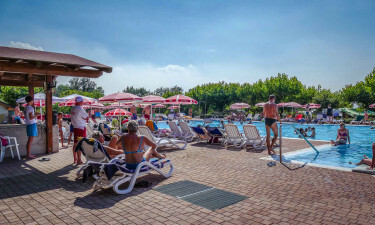 Another added bonus is the fact that Camp Belvedere is very near the sports and entertainment centre of Acquasplash Caneva Canevaworld, and Gardaland, the best amusement park in Italy, is only a few kilometres away! Make a reservation with Lux-Camp today to guarantee your pitch and look forward to a luxury camping vacation filled with fun! Why Should I Camp at Camp Belvedere? Outstanding views of Lake Garda. Plenty of organised activities for all the family. Conveniently near the pleasant tourist town of Lazise. Plenty of facilities, including a sunbathing terrace with parasols and loungers. Camp Belvedere is a luxury camping site that has a fabulous swimming complex with a whirlpool, children's pool, water chutes and a large lagoon. There is also a pebbly beach right on the shore of Lake Garda. Although a popular campsite, the location is remarkably quiet, so ideal for young families. A camping holiday in a mobile home is much more enjoyable when everyday conveniences are close to hand, and Camp Belvedere certainly lives up to the highest expectations. There is an excellent restaurant serving Mediterranean cuisine, with views of Lake Garda. There is also a pizzeria and a snack bar. Groceries can be bought at the nearby local supermarket.